Even though Lilly Ledbetter Fair Pay Act was passed in 2009, fair pay there is not. In June, there was a measure to strengthen the Lily Ledbetter Fair Pay Act. This was the Paycheck Fairness Act. But, unfortunately, common sense and basic empathy were MIA in Congress and the Act did not pass. However, my biggest concern rests with the American women–and so-called ‘feminists’–who continue to embrace a philosophy of dependence. The same women who once decried fairytales where men rescued damsels in distress are now all-too-comfortable awaiting the rescuing hand of Big Daddy government. Firstly, this article tries to emphasize that Obama is the one who has declared the War on Women. They throw in a fact about how the number of unemployed women have increased since Obama’s inauguration. What they fail to mention is how Obama inherited an absolutely disastrous economy and that unemployed women and men alike have increased dramatically. In fact, according to FactCheck.org, it is men who have suffered more (Diana Furchtgott-Roth dubs this a “man-cession).” I am not condoning that men should be losing more jobs, I am merely showing how FOX is manipulating the facts. Secondly, FOX throws around the term “feminist” (it reads as terribly sarcastic, don’t you think so?) but I truly do not think they know what it means. The idea of independence from government is very much a Republican ideology, but the idea of having just government mandates is certainly on the feminist platform. 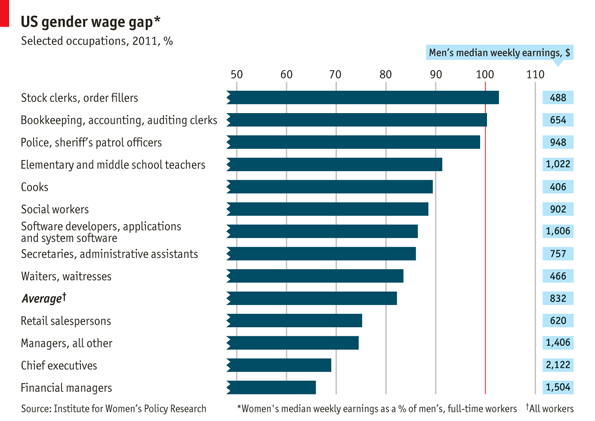 Feminists should depend on the government to give them equal pay, because how else are women going to get it? By being left alone and allowing sexist bosses to run amok? It’s a frightening thought. As if we need more sexism in politics, given the drastic under-representation of women.